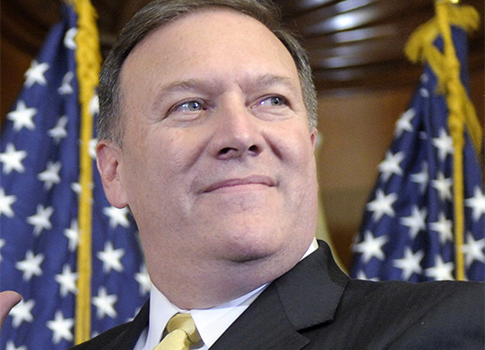 Rep. Mike Pompeo (R., Kansas) was confirmed Monday night as the new director of the Central Intelligence Agency for President Donald Trump's administration. Pompeo is the third person appointed by Trump to be confirmed to his cabinet position. As head of the CIA, Pompeo will be mainly in charge of "managing a global spying network at a time of escalating security problems, including renewed aggression from Russia, the nuclear ambitions of North Korea and the splintering terror threat posed by the Islamic State," the Washington Post reported on Monday night. He was confirmed with a 66-32 vote, according to Reuters. Pompeo was confirmed despite a delay tactic by the Democrats. Senate Minority Leader Chuck Schumer (D., N.Y.) told MSNBC's Chuck Todd on Sunday morning that there was an intention to delay the voting to confirm Pompeo. Todd told Schumer that it seemed like a "petty delay tactic." After this comment, Schumer continued to defend the delayed vote. UPDATED 8:21 P.M.: This post was updated to include the vote count. This entry was posted in Politics and tagged CIA, Mike Pompeo, Trump Administration. Bookmark the permalink.